Like clockwork, our research robot monkeys (not the new CRAPPERS) but the old school ones caught Obama making an unbiblical bow. Note that Obama is bowing at approx. 90 degrees (bad bad bad!!!) 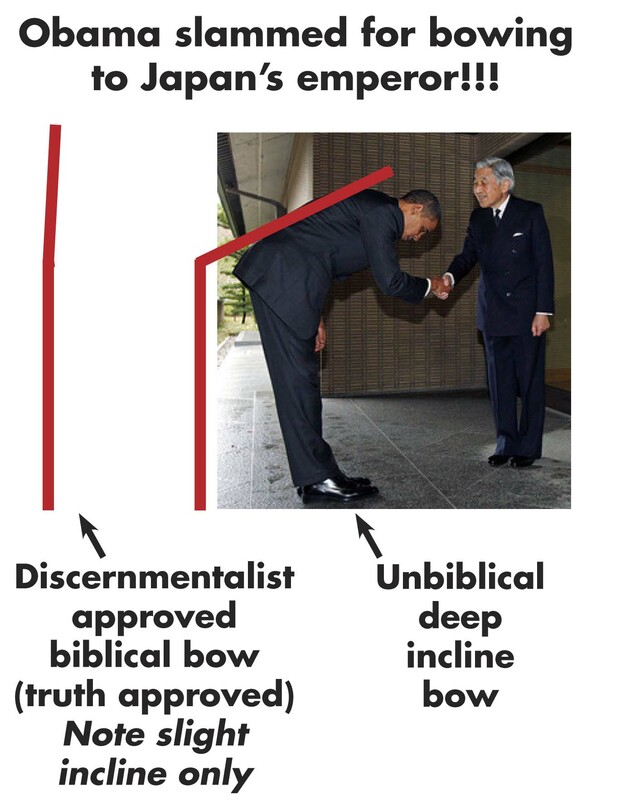 Biblical-Conservative-Republican-Absolute-Truth-Honouring-Christians only bow of 1 degree (any other angle is untruthful). In fact anything more than a head nod could be misconstrued of as complete Baal Worship….or worse (ie Befriending a Democrat). Remember, that a discernmentalist should be weary of respecting anyone….and bowing only at most….1-2 degrees (even this is almost extreme). This entry was posted on Wednesday, November 18th, 2009 at 4:37 pm and is filed under absolute truth, american gospel, bow, but it is really all about me!, Camp of the Apostates, Contempt, Democrat, Democrats from Hell, dirty hippies!, Discernmentalist, Uncategorized. You can follow any responses to this entry through the RSS 2.0 feed. You can leave a response, or trackback from your own site. At least this is more educational than one of the reality Television stars, kim this?